If you're looking for a show to visit with a group of friends look no further, Yayoi Kusama at Tate Modern is it. Whether you like brightly coloured paintings that make you feel a bit dizzy, squishy sculpture, surreal video art or collage Kusama can cater for everyone. She's had time to, the 82-year-old has flitted between Japan and America and back to Japan and between, drawing, painting, sculpture, environmental art and back to painting throughout her whole career, returning to different mediums throughout, as she felt like it. 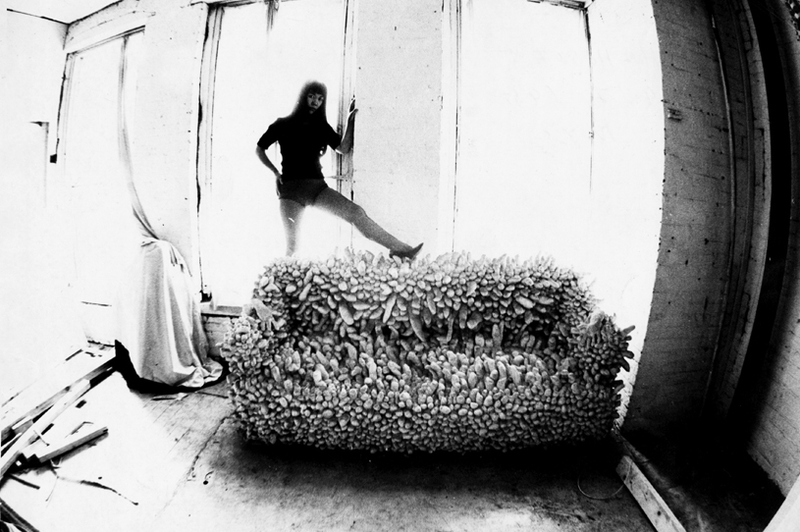 I find Kusama, simultaneously, crazy, amazing, talented and a bit more crazy. But this all contributes to her obsessive works, they wouldn't work without it. Kusama's recent work (top), (Victoria Miro gallery is showing the bulk of Kusama's new works until April 5), is bright and quite different to what I know her for, she's branched out and used more than one motif in each painting. But for me the reason I like Kusama's work is because she is so repetitive. My first question is how does she keep it up? Surely she gets arm ache completely those humongous canvases sometime three times her height. Her bingo wings must be non-existent. My favourite pieces are from her Infinity Nets series. I'd only previously seen brightly coloured Infinity Nets paintings, but on show at the Tate are canvases which are almost white. With names like Pacific Ocean you get pulled into and washed over by the infinite waves of Kusama's patterns, which feel like they spread even further than the square canvases they are restricted by. The finale of the exhibition is two rooms, which almost seem like afterthoughts compared to the time spent Kusama's career before the seventies. I'm Here but Nothing and Infinity Mirrored Room needed much more space, more time to be immersed in their environments, in Kusama's environment and world of hallucinations which she says they physically represent. This was not entirely the experience received at the Tate, you're herded through, especially in Infinity Mirrored Room. This does not add to the immersive experience at all. Maybe it was because we went at a busy time (it was a Sunday, probably our fault then), so I would definitely suggest first thing in the morning on a weekend or go during the week.